NEXT MEETING: Tuesday, September 6, 7pm. 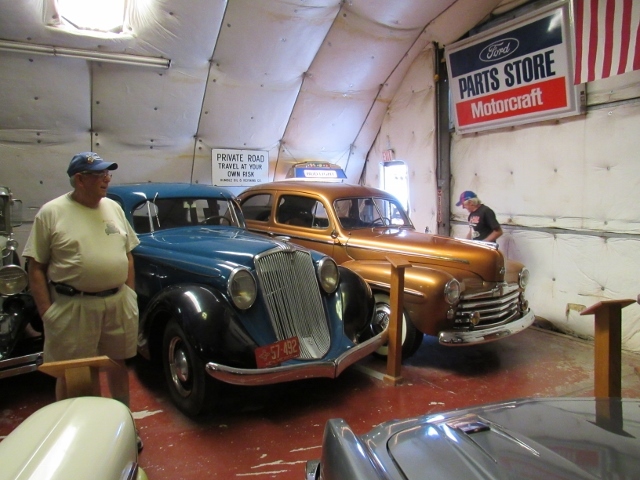 The program is a comparison of the 1941 and 1951 Ford automobiles. Refreshments by the Glovers and Ray Calderone. BREAKFAST GROUP: Saturday, September 17th at the TA Truck stop in Moriarity, see article below. This month we continue our series of comparing cars at 10 year intervals. This meeting also features the 75th anniversary 1941 car. Jeff and Bob and Max can share their view and experiences with these cars to start the discussion, then we'd like everyone to help us further explore the cars of 1941 and 1951. We will be meeting at 8:30am on Saturday, September 17th in the parking lot of Smith’s at Central and Tramway NE. From there we will be driving old 66 to Moriarity where we will breakfast at the Country Pride Restaurant at the TA Truckstop on the west end of Moriarity. The weather should be splendid for getting out your flathead and taking a short road trip. Sunday, September 11th is V8 day at the New Mexico State Fair. Club members will gather in the parking lot of The Caravan East (7605 Central Ave NE) and depart for the fairgrounds promptly at 7:30 am. We have been asked to enter as a group. All club members and any other interested flathead drivers are welcome to join us. 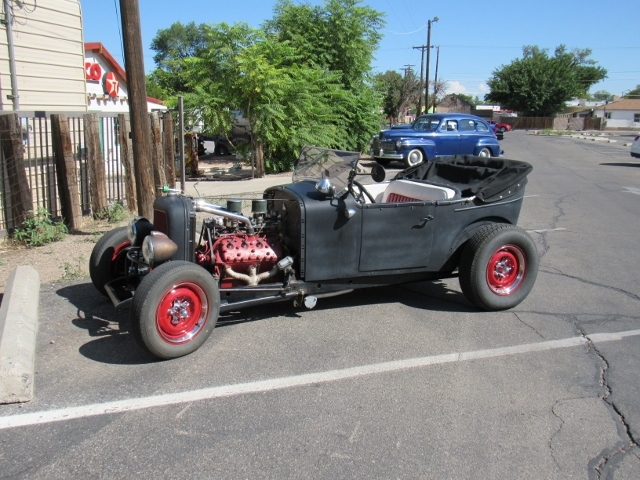 The New Mexico Council of Car Clubs and Village of Los Lunas are sponsoring their 38th annual Meet in Los Lunas on Hwy 314 and Morris Road. Vendor setup is Friday, September 23rd after 12 noon and the swap meet opens Saturday, September 24th at 7:30 am to 5:00 pm and Sunday, September 25th from 8:30am until 3:00pm. Several of our members will be there selling valuable merchandise, so head on out and look for that special part you have been needing. Each year the swap meet gets bigger and better! If you wish a spot to sell some of your own valuable merchandise, contact Joyce at 505-450-1203. In February I noted that “The major cited potential advantage of these smart cars, safety, was also cited as a potential disadvantage. What happens if your guidance system is hacked or just fails?” Well guess what? A recent Associated Press article noted that the driver of a Tesla S vehicle was killed on May 7, 2016 when his vehicle was operating in the “Autopilot” mode and crashed into a semi-truck that crossed if front of him. The driver, Joshua Brown, was watching a Harry Potter movie before the crash. Apparently the Autopilot could not distinguish between the white truck trailer and the sky. Kyle Landry of Lux Research noted that there is “no mechanism in the system to enable it to know what it doesn’t know”. Tesla commented that Autopilot “still requires the driver to remain alert”. Autonomous? Sure, just relax. Our August breakfast and tour were outstanding. 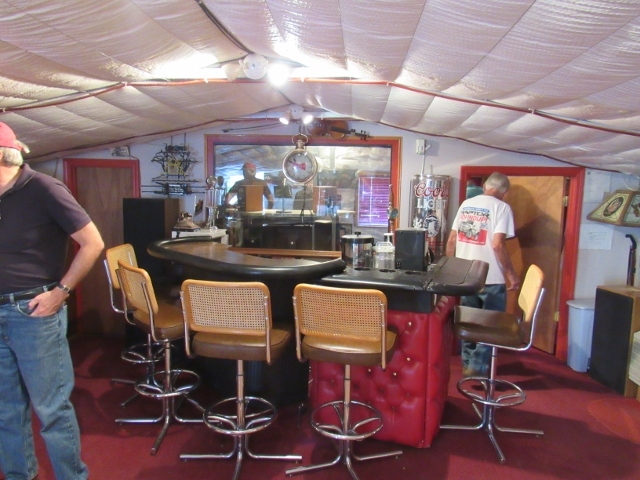 After a breakfast at “Lollie’s” (our fallback when Little Anita’s proved low capacity), we were treated to a tour of Sam Griego’s wonderful Route 85 Museum. See photos elsewhere. Even the drive on Isleta Blvd was excellent. Did you note the giant roadrunner, the little castle, and the second story mobile home? Five raffle tickets to the member that can provide addresses or pictures of these landmarks. The meeting this month will feature presentations on the 1941 and 1951 FoMoCo products. Come on down and bring your friends! Meeting was called to order by President Joe. Guest Steve Lare was introduced. No corrections to minutes, they were approved. Treasurer’s report: club is still solvent. Joe passed out info on Southwestern National meet. Old business: Breakfast August 27th, trying to arrange a tour of Sam Greigo's museum. There were several interesting door prizes for raffle. New business; Sept 11 is our day at the fair. There will be a Board meeting next Tuesday, Joe's house 7 pm. Thanks to George Abernathy for refreshments. Interesting program by Jay Hertz and Bob Quirici on 1936 Ford cars and trucks. Meeting adjourned. Thank you, Mary, for taking the minutes. Six of the eight board members were present. Lou will be in charge of heading up the September 11th State Fair event. The club members will meet at the parking lot of the Caravan East and will depart promptly at 7:30am to drive into the fairgrounds. We will set up a small table with club information as this is the best event at which to engage the public and educate them on Flathead V8’s and our V8 Club. Jeff will be in charge of the September 6th meeting program, comparing the 41 and 51 Fords. The September 17th breakfast will be held at the TA truckstop in Moriarity. We will meet at the usual place, Smith’s at Central and Tramway so we can drive together. The nominating committee for new officers will be announced at the September meeting with nominations to be announced at the October meeting. The October meeting program will be on auto art with Joe coordinating. The October 15th breakfast will be at Sopa’s in Bosque Farm with club members meeting at the Pit Parking Lot at 8:30am to drive together. There is an interesting church in Tome to visit after breakfast if anyone is interested. The ballot for new officers will appear in the November newsletter with elections to be held at the November meeting. The November meeting will also have a tabletop model show unless someone comes up with a better idea. The November breakfast will probably be an antique shop tour and lunch on November 19th and will be coordinated by Beth. The December Christmas Party is to be a potluck again as we had last year. We will be soliciting hosts for the December 10th event so please be thinking about it. Breakfast will be held at Kap’s on Central on Saturday, December 17th. Jeff demonstrated the video that was shot of Jay and his car. The board discussed different ways of filming. The camera will go to the State Fair to do some practice filming. Sunday 11th State FairMeet at the Caravan East before 7:30am. Saturday 17th Breakfast – 8:30am, TA Truck Stop in Moriarity, meet at Smith’s, Tramway and Central. September 13-19, 2016 – Great Southwestern National Driving Tour, Colorado and Eastern Utah. Sponsored by the Hi-Country Regional Group, contact 9gwst2016@gmail.com or Lou Mraz 303-548-0168. 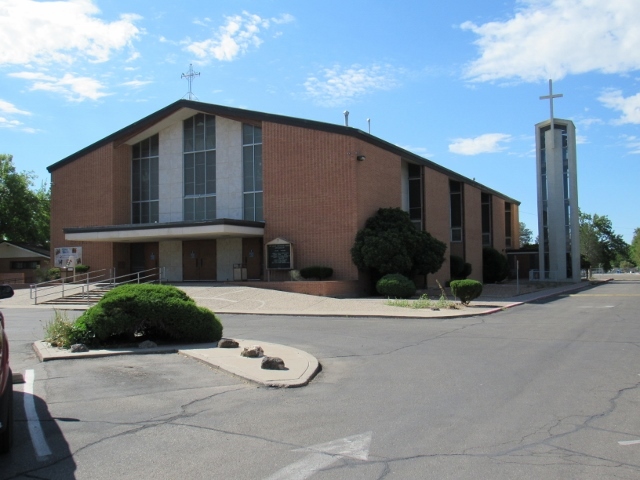 This week-long tour will begin in Canon City and end in Monument Valley or western Colorado (as you choose), with a return back to Canon City for those who need to do so. This tour is a long distance driving event, which will cover approximately 1000 miles. 7am-10am – Show 10am-4pm, Open to all years makes and models, Entry $20 – 30 classes – 25 Special Awards, 50/50 drawing and raffle supporting the Leukemia Lymphoma Society. Music by Steve's Cruisin’ with the Oldies – 505-269-0496 or 505-332-9222 for info. Italians, Masterpieces (previous year’s winners) – Submit cars online at www.SeeHotCars.com or 883-6240 for more information.